Queen of England and Ireland (1533-1603). Document signed ("Elizabeth R"). No place. Three vellum membranes. Later endorsements, a few early ink marginal markings and underlinings, substantial fragment of Great Seal in white wax pendant on original vellum tag, ink somewhat faded on first membrane, some light staining, seal discoloured and. 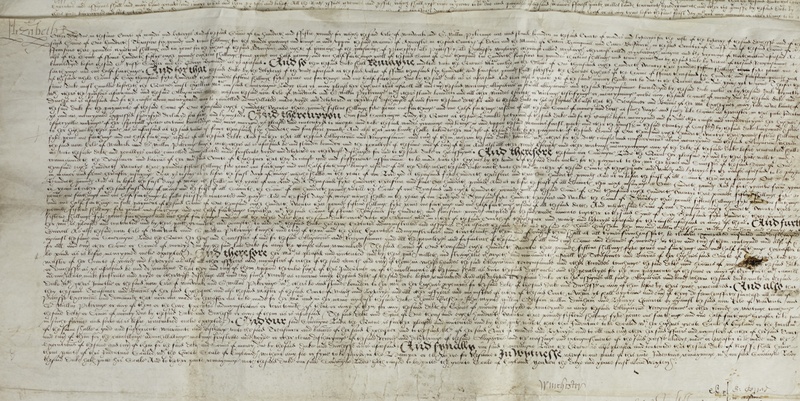 An indenture detailing the exchange of lands between the crown and Thomas, 4th Duke of Norfolk, signed three times by the Queen, recording that the Duke will "sell geve and graunte unto our Soveraigne Ladie the Quene All those his Mannors & Lordshippes of Chesworth and Sedgewicke [...] in the County of Sussex [...] also all that mannor Lordshipp and Forest of St Leonard and all ground and Soyle of the same Forest And also all those his Parkes of Bewbushe and Shelley", and related lands and rights, in exchange for lands in royal gift including the "Celle of Sainte Leonard in her county of Norfolk" and associated lands and buildings "neare unto the Citie of Norwich", Norfolk lands formerly of Wymondham Abbey, lands in Essex (Wigborough, Saltcote, Tollesbury) that were formerly "assigned to the late Ladie Anne of Cleves" and also lands in "Pitchesey" (Pitsea) in the same county, the manor of Dowdike in Lincolnshire (previously of Crowland Abbey), and lands of Newenham Abbey in Devon. The indenture then lists the extensive debts of the Duke to the crown, further detailing that a portion of this debt is discharged by the value of the woodland hereby sold to the crown, and commands the exchequer to produce a new bond for the residue of the debt, being a mere £1823 15s. 5 3/4d. Signed by the Queen at the head of each membrane, additionally signed at the foot by the Lord Treasurer William Paulet, Marquess of Winchester ("Winchester"), the under-treasurer Richard Sackville, and the Chancellor of the Exchequer Walter Mildmay. - Thomas Howard, 4th Duke of Norfolk (1538-72), was the head of the powerful Howard family. He was a Privy Councillor, had commanded English forces in Scotland at the beginning of Elizabeth's reign, and was one of the greatest land-owners in the land, with estates centred on Norfolk. 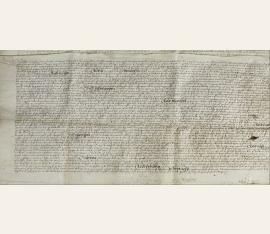 The agreement with the crown that is formalized in this document saw enormous tracts of land near Horsham in Sussex - including the 12 square miles of St Leonard's forest - conveyed to the crown. Norfolk gained considerable land in return, primarily former monastic land scattered across four counties, but - and this was probably of greater importance to him - he also saw his overall debt to the crown, which had been more that £6500, reduced by some £4680. The counterpart of this indenture remains in the Exchequer (The National Archives, E 211/39). Less than ten years after this agreement was made, Norfolk was executed for treason for conspiring with Mary, Queen of Scots. His son and heir, Philip, Earl of Arundel, was permitted to inherit most of his estates..